To have a successful year you will need to do some homeschool planning. When you first start teaching your children you will want to sit down and develop a vision. You will need to think about what you want to accomplish by education your child at home. Each year you will want to write down some educational goals for each of your children. You will need to find curriculum that will help you accomplish your goals. You will also need to look at your schedule and plan when you will homeschool. From this passage we can conclude that we need to start our homeschool planning with God. We need to feel that homeschooling is God’s will for our family. We need to read His Word and seek His advice through prayer. Homeschool planning should include a mission statement. A mission statement is usually for business but can be used in this situation too. A mission statement guides our actions, determines our goals, and guides how we make decisions. My mission statement determines the activities that my children are involved in. It also determines the curriculum that I use. So our mission statement for our homeschool is that we will educate and instruct our children with biblical principles so that they might become disciples of Jesus Christ. Homeschool planning should include some goals. We will have long term goals. We will also have some yearly goals and daily goals. Our long term goals are included in our mission statement. Each year we want to look at what our children already know and what we want them to know. We usually know what areas that our children struggle with and what they do not know. Looking at tests can also help us. To help you see what skills your child needs you can look at a scope and sequence. The series What Your Child Needs to Know … by is helpful. Each book lists skills that a child in that grade range should know. You will also need to look at your goals throughout the year. Look to see if your child is progressing. You may need to spend more time on a concept. Your daily goals are your lesson plans for the day. You should have some idea of what your child will be doing in Bible, math, language arts, history, and science. Now that I have a broad overview of why I am homeschooling I need to start planning what we will teach each year. One of my main goals is to teach my children a biblical worldview. I will use the Bible for curriculum. I will then find science, history, English, and math courses that are written from a Christian view point. While I am planning I will keep the biblical view of education before me. In scriptures it states that knowledge puffs up but love builds up (1 Corinthians 8:1-3 ESV). So I should teach my children that we should use our knowledge to help others and not to be proud about what we know. I also need to remember that all knowledge comes from the Lord (Colossians 2:3). So I pray about what we will teach and the curriculum that we will use. I always teach the core subjects of Bible, reading, writing, and arithmetic. Next in line is science and history. I will also want to consider my child’s interests and talents. Next I will want to think about how I want to teach each subject. For many years I used a curriculum that integrated the Bible into science, history, and language arts. Other families teach the Bible as a separate subject. I can also save money on curriculum by using the free downloads from the internet. I can also use resources for my public library. So I gather my academic supplies. I might buy a unit study for the whole family or textbooks for each child. Next I will look over what I have chosen. For each child I will write down how we will use the materials. I will write lesson plans for the first month. Another area that should not be forgotten in homeschool planning is life skills. Many times children learn spiritual things through doing work. Jesus taught about heaven with parables. We should do the same. We should have our children involved in gardening, grocery shopping, and home repairs. Children should be taught to work. It is good to keep your homeschool planning written down. Then you can refer to it during the school year. Your planner should have a calendar. On your calendar write down when you plan to start school, vacation days, and when school is over for the year. You will also want to have a daily schedule. Write down what subjects you are doing when. You might also want to include chores into your schedule. Next write some lesson plans for each subject. I usually only make lesson plans for one month. On you lesson plans you might like to list any supplies and library books that you need. You can keep your homeschool plan in a notebook. There are some free planners that you can download. 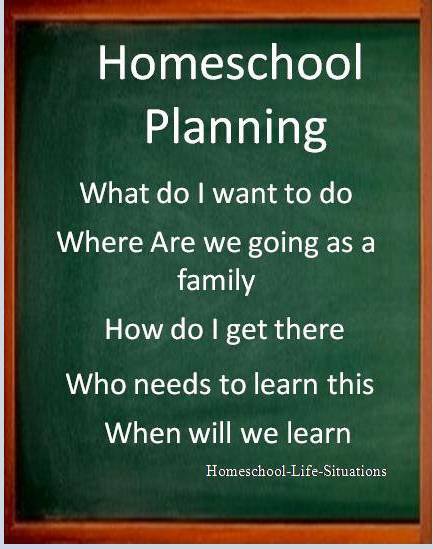 Your vision, goals and lesson plans are all part of homeschool planning.